Designing a new home page for my website. 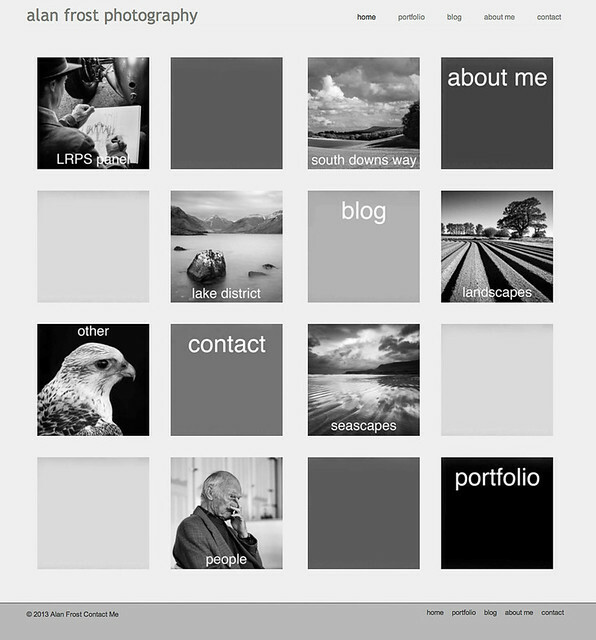 When I first designed my website – alanfrostphotography.co.uk I was very happy with most of the pages but the home page itself didn’t inspire me. I felt it needed a more contemporary look, and something which would more closely depict my black and white approach to photography. I also wanted it to be easier to navigate, so that anyone visiting the site could quickly get to a particular page. So this past weekend I set about a re-design and here is the result. It still retains the traditional menu at the top but now each of the titled boxes link directly to the relevant page of the site. The original home page only showed one image unless you waited for the carousel to kick in, but by then my guess is that any visitors had either moved on to another page or left my site altogether, which is much worse! I am pleased with the result and if offers scope to update the home page when I add new pages to the site itself. Experimentation and still time for tea!